Of all the Russian cameras I own there are only a few that I consider to be the true workhorse cameras. The Zorki 4K is one, the Zenit-E and Zenit 12 are too. Meet the Fed 4 and Fed 5. 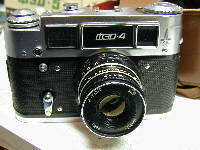 The Fed 4 and 5 are delightfull non pretentious cameras. 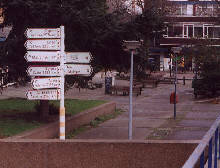 Direct decendants from the first Leica copies but improved, altered and changed in a way that some hate and some love. Some say they lack style, lack finesse, but I dare to say NO. These are workhorses. And workhorses form a class of their own. Big bricks of metal, removable back and built in lightmeter. Yes, the 4 and 5 may be tanks but they have enough speeds and can take any LTM 39 lens without problem. They don't need batteries, so here comes the old problem with the selenium cell again. I know this problem from the Zenit-E. The 4 and 5 that I have do not have a problem both lightmeters work as they should and are on the mark. But like the Zenit-E the 5 does not have a good reputation. Many claim that the 5 series was one of the worst rangefinders in production, quality wise. I can not be sure of this reputation of the Fed 5. The one I have is a boxed version and if it has seen 10 rolls of film I would call that a lot. About quality I can say this. It works flawlessly. Rangefinder is accurate, very accurate. The lens is an I-61 L/D, nicely coated and contains Lanthane glass elements. It is sharp too. To be honest, I have looked for flaws on the Fed 5 but I could not find any. It is one of the last rangefinders built, only Leica and Voightlander still make a rangefinder. The 4 is something else, allthough both cameras have the same specs, it has a little more class. Still the 5 is just a redesigned 4. If there is one flaw in these cameras than it is that I find them a little too big. Esspecially if you compare them to a Fed 2 or a Zorki 2. But the Fed 4 and 5 both have a lightmeter. My favourite is still the Fed 5. It is what it seems to be, a camera. No pretence, no attitude, it is a camera. I'll end with a little history. Both cameras have the same speeds, B, 1 to 1/500. Both have the LTM 39 (Leica Thread Mount). The 4 series knows two versions, the 4a and the 4b, this is not shown on the camera and the 4b is identical to the 4a except for a few cosmetic changes. The a has Fed engraved on the front and the b has a label on the front (several markings exist). The 4a was produced from 1964 to 1971 and almost 230.000 units were made. The 5 series consists of 3 different cameras, the 5, the 5b and the 5c. 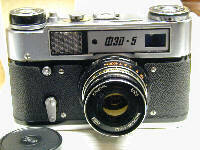 The 5b is a 5 without a lightmeter, also see the Tom Tiger and the Red FED article for info on the 5b. The 5c is almost identical to the 5 but has no dioptre adjustment on the viewfinder and has more plastic. Production numbers, the 5 was produced from 1977 to around 1991 and saw more than 269.000 units built. The 5b was produced from 1975 up to 1991 226.343 units built. The 5c was produced from 1977 to around 1991 more than 225.000 units built.